How Often Should You Clean Your Hair Tools? We’ve all been warned of the dangers of not cleaning our makeup brushes enough. But how often should you clean your hair tools? Your straightener, curling iron, brush and even your blow dryer are also magnets for product buildup and, even grosser, bacteria. To prevent limp locks and—ew—scalp infections, follow these stylist-recommended cleaning tricks. Your brush should be cleaned weekly. While your stylist cleans his/her brush after every use with barbicide (and if they don’t, you need a new hairdresser, stat! ), you should shampoo yours at home about once a week. “It’s important to take out the hair, and you can also use a mild antibacterial soap, which can even be used on brushes made with natural boar bristles,” says got2b celebrity hairstylist Larry Sims. Your hot tools should be cleaned monthly. All hot tools, like curling irons and straighteners, should be cleaned once a month, says Sims. If your heated tools never encounter any product, you can just scrub with water in case any debris has settled from the air. However, when used with hair products, it’s imperative that hot hair tools be cleaned more often. “Hairspray especially is sticky and comprised of alcohol, so it can add extra stress when being dragged over the hair,” says Kristabelle Laugalys, a hairstylist at José Eber Salon. This makes it not only harder to style, but your hair won’t feel as clean (not surprisingly!). Plus, a dirty tool placed on clean hair can transfer bacteria if it isn’t cleaned regularly. Yikes! Aim to clean your straightener or curling iron every two weeks. “There are cleaners for your hot tools, similar to a brillo pad, that you can find at your local beauty supply store,” says Sim. Jilbere Clean Tool Kwik-Clean Pads ($4.99) are our favorites; just scrub back and forth for a few seconds, rinse with a wet cloth and then let your tool sit to dry. If you don’t want an extra purchase, Laugalys recommends using a rag damped with rubbing alcohol. Your blow dryer should be cleaned every three weeks. Because your hair doesn’t actually touch the blow dryer, you may think it’s exempt from a cleaning. However, a dirty filter will cause major performance problems. “After weeks of blaring air, tiny lint particles will gather and attach to the dryer’s filter; blocking airflow and making it seem as if drying takes forever,” says Melissa Peverini, a hairstylist and Cricket’s brand ambassador. Below she offers a simple how-to that’ll extend the life of your dryer dramatically. Step 1: While the dryer is unplugged, remove the cap over the air intake and rinse it with soap and hot water. Step 2: “Use a toothpick to pull out the dust bunnies.” Refrain from using your fingers as some versions may be sharp. Step 3: Screw the cap back on and you’re done! 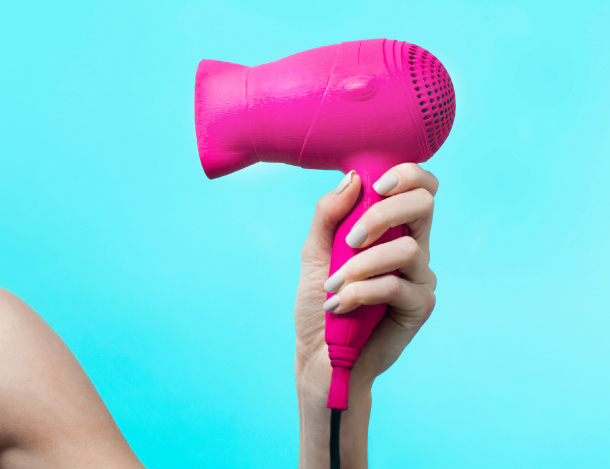 Do this every three weeks, and not only will you have even more gorgeous hair, you’ll extend the life of your blow-dryer, too. Now that’s a beauty win-win.